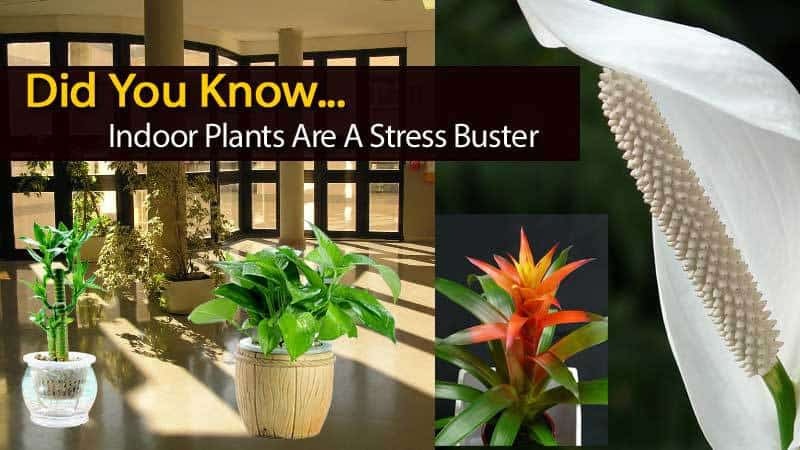 Did You Know Indoor Plants Are A Stress Buster? With the holiday season approaching, one will undoubtedly experience an increase in stress. There is good news, though. Something as simple as an indoor plant can reduce this stress. Research has proven that simply being able to look at greenery will bring down stress levels… so really you can have them year round. Indoor Plants can Bust Workplace Tension with a Green Stocking Stuffer! Two-thirds of full-time workers across the nation say they experience stress in the workplace around the holidays. This according to a recent random sampling of 600 full-time workers at Accenture HR Services. Almost a quarter of the workers surveyed expressed that they have taken at least one day off in the past because of holiday stress. Why All this Stress During the Holidays? There are gifts to buy (houseplants are a gift option) and time is running out. Your kids need extra time and care because they’re out of school. Then there are the holiday parties you’re obligated to attend but still need to do your grocery shopping. You planned to take a day off from work but several of your colleagues beat you to the punch – they already scheduled vacations or called in sick with the holiday shopping flu. As for the major causes of holiday stress, 54 percent cited finding the time to shop for gifts, while 41 percent mentioned keeping up with day-to-day responsibilities. Having plants inside does not just affect the indoor climate. Researchers have discovered that “seeing” greenery can result in a demonstrable reduction in stress within five minutes. Why not add a watermelon peperomia, one of the varieties of birdnest snake plants or the reliable, sturdy jade plant to your desk and workspace. Research in the Netherlands has shown that people who spend more than four hours a day working at a computer monitor feel better and are more productive with plants in the workplace! So this Holiday season keep a plant at your desk, and maybe buy one for the Scrooge down the hall. Stay close to your live green plants. They reduce systolic blood pressure within five seconds of exposure. Do at least 30 minutes of exercise a day. A brisk walk out doors, workouts, swimming, yoga stretching, dancing, sports, Tai Chi etc. Take up gardening to reduce stress Doctor’s Orders! Take several 5 minute centered breathing breaks a day. Try relaxation visualizations to soft music. Scheduled pamper time. Massages, a facial, or hot bath. Get extra sleep and take naps whenever possible. Thank you to PlantCareToday for providing the original article here .